One week after riding his first winner for the Lim’s Stable, Troy See doubled up the dose for the champion outfit with another winner on Friday, Lim’s Revent. This year’s leading apprentice jockey has been donning the popular blue and yellow stars jacket a lot more often of late, with Lim’s Force sealing the budding partnership with a first hurrah in a lowly Kranji Stakes D race over 1200m last Friday. With See booked on a more high-profile Lim’s Stable ward later, it was clear that Mr Lim Siah Mong, racing manager Mick Dittman and trainer Steven Burridge were keen to throw more support behind the Singaporean lad. The plum ride is Group 2 Aushorse Golden Horseshoe winner Lim’s Lightning, who is making his much-awaited racing comeback later in the proceedings, in the $80,000 Class 3 Division 1 race over 1200m. Lim’s Revent (Troy See) off to his first win at Kranji on Friday night. While Lim’s Revent was only a warm-up to the main assignment, See showed he was worthy of the trust with a copybook ride aboard the well-backed galloper ($18), who just like Lim’s Lightning, was also resuming, in the $60,000 Class 4 Premier race over 1400m. Never far away from the leading duo of Grand Knight (Ryan Curatolo) and Gold Crown (Michael Rodd), the Redoute’s Choice four-year-old was ridden patiently before let loose in the home straight. Once See slipped some reins at the 400m, Lim’s Revent went on to assert his superiority in no uncertain terms, racing away to a two-length win from Verizon (Glen Boss) with Sun General (Daniel Moor) third another half-a-length away. The winning time was 1min 22.53secs for the 1400m on the Short Course. 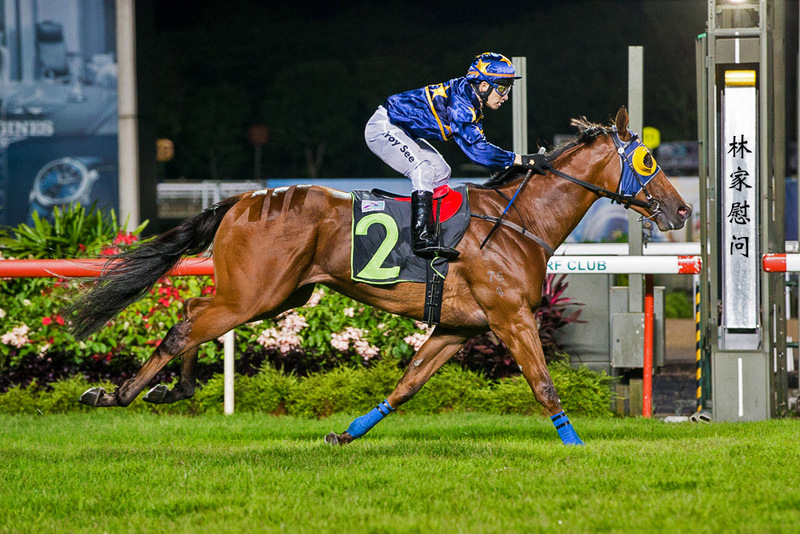 Twice third at three previous Kranji starts, Lim’s Revent was opening his Singapore account, which Burridge was hoping would swell further now that that first win was out of the way. Known as Severence in Australia, he came to Singapore with a record of one win in a 1400m race at Kembla Grange in five starts for trainers Peter and Paul Snowden. “There was a bit of give on the track at his first runs. He is a big gangly sort who needed more time to mature and that’s why I gave him a little bit of a break,” said the Australian conditioner. “He’s actually a half-brother to Lim’s Bestow, who we thought had a lot of ability. Hopefully, this one can develop into a good horse with more maturity. “Troy rode the horse very well and did a good job on Lim’s Force last week as well. Lim’s Force is actually a miracle story as she nearly died earlier this year. See, who will be representing Team Asia alongside Joao Moreira and Vlad Duric at the inaugural Premier Gateway International Jockeys Challenge on September 25, was with that latest win extending his lead in the apprentice jockeys’ log to five wins on defending champion Wong Chin Chuen with that 23rd success. “It’s my first time riding this horse. I was given the speedmap of the race and everything went as planned,” said See.